FishFlix.com is such an inspiring company that sells Christian movies. You can find a huge variety of movies through their online store. I was doing some browsing and found some great movies that would make awesome gifts this upcoming holiday season. I was thrilled to be able to review Do You Believe? on DVD. It also can be purchased in blue ray. We were not able to see it at the theater and I had heard wonderful things about this movie from the creator of God's Not Dead. It was indeed all that I heard it to be! Do You Believe is rated PG13. We chose to let our younger children watch it. The movie does include an accident that was a bit scary for my 7 year old, and the themes can be a bit over their heads. Use your own discretion. I love that my husband really grabbed ahold of this film and the question Do You Believe? He had been studying in John where Jesus often asks whether someone believes. In John 16:31 Jesus says "Jesus answered them, "Do you now believe?" John 14:10 is another example, "Do you not believe that I am in the Father, and the Father is in Me? The words that I say to you I do not speak on My own initiative, but the Father abiding in Me does His works." It was like we were meant to watch this movie at just this precise time! This film takes a look at 12 different people and how they eventually are impacted by a pastor and church family. 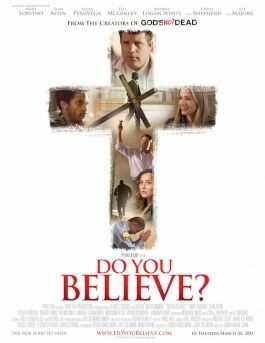 The pastor hands out crosses to his congregation in a message on Do You Believe? after meeting a man on the street carrying a large cross. The cross gets into the hands of a paramedic, janitor of the church, an older couple who are bearing their own loss, and each person's stories are then expounded on and include other people that they minister to. The families are able to minister to a homeless widow and her daughter, a drug dealer, and a atheist lawyer through a working of the Lord. This movie shows us how we can work to minister to others and be the body of Christ. To ask ourselves if we believe enough to step out of our comfort zone and minister to those who may be different than we are. Some of the cast members include; Mira Sorvino, Sean Astin, Alexa Penavega, Ted McGinley, Andrea Logan White, Brian Bosworth Lee Majors and Cybill Shepherd. They all did an outstanding job. I found it unique that Sean Astin actually played the atheist in the film. We have seen several Christian Films where he is the main Christian, so it was a bit of a role reversal for us. The film is 119 minutes in length and would be a great movie to watch with your family for movie night, with your youth group, or small group setting. A wonderful opportunity to grow together as a community of believers. FishFlix has many other great movies on their website. See what some of the latest reviews are by clicking on the banner below.